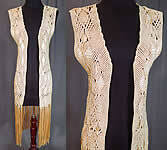 This vintage yellow boho macramé crochet silk ribbon fringe shawl long vest jacket dates from the 1960s. 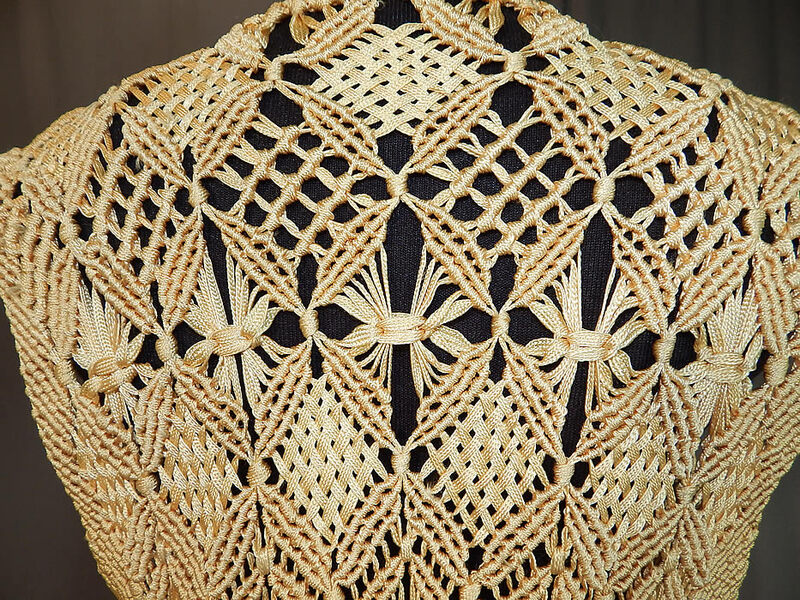 It is made of a pastel yellow silk ribbon work fabric, with macramé crochet sheer woven decorative diamond designs. This lovely long sleeveless vest style jacket has a hand knotted yellow silk fringe trim along the bottom, an open front with no closure and is unlined. The vest measures 27 inches long, with an additional 14 inch long fringe, a 30 inch waist and 30 inch bust. It is in excellent condition. This is truly a wonderful piece of wearable bohemian macramé textile art! 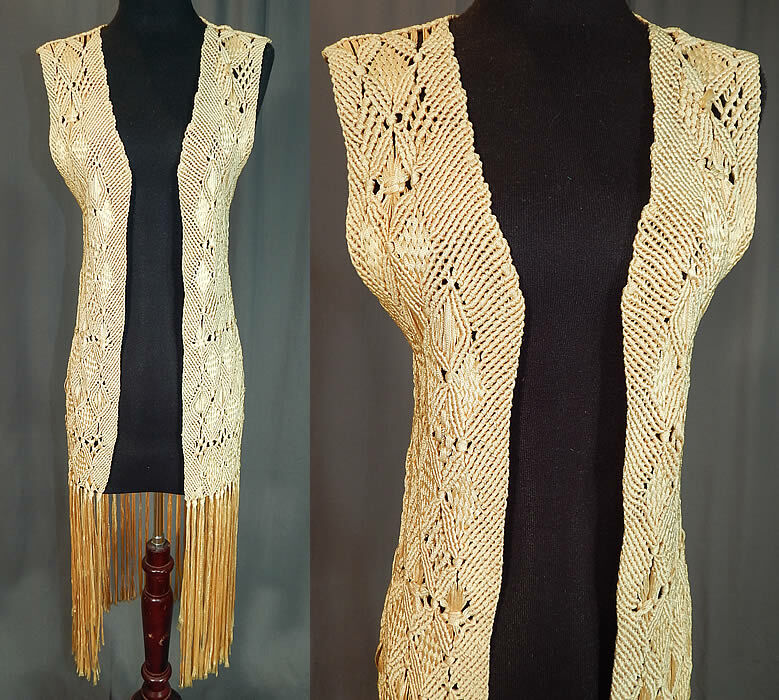 This vintage yellow boho macramé crochet silk ribbon fringe shawl long vest jacket dates from the 1960s. It is made of a pastel yellow silk ribbon work fabric, with macramé crochet sheer woven decorative diamond designs. This lovely long sleeveless vest style jacket has a hand knotted yellow silk fringe trim along the bottom, an open front with no closure and is unlined. The vest measures 27 inches long, with an additional 14 inch long fringe, a 30 inch waist and 30 inch bust. It is in excellent condition, with only a slight musty odor. 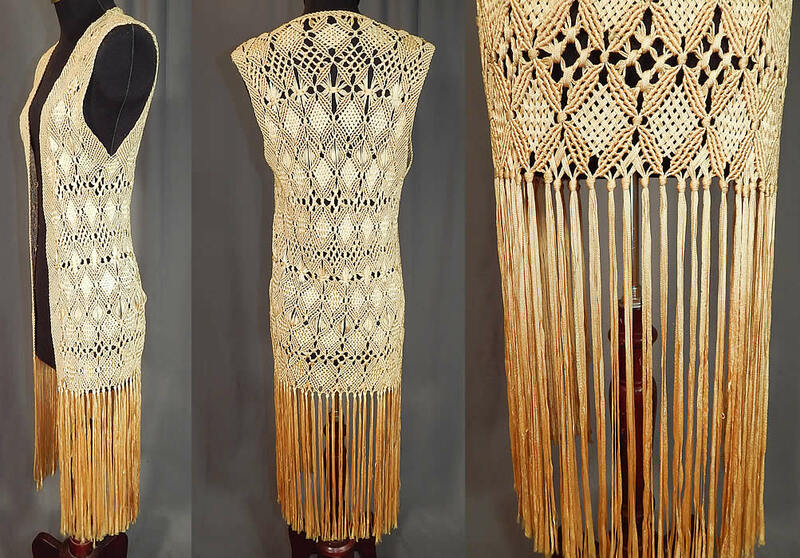 This is truly a wonderful piece of wearable bohemian macramé textile art!